I wore an original 1960s day dress with a cherry motif all over with a matching belt. So often reproduction clothing embraces the cherry, so I love that this is an original! It came from MK Handmade and Vintage Fair. 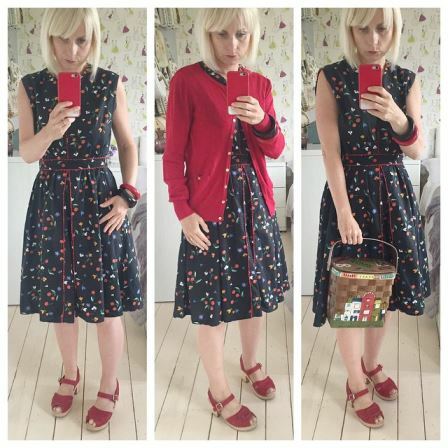 I am also wearing my Lotta from Stockholm clogs, a Caro Nan wooden box bag and a modern red cardi from Tesco. My hair is so overgrown here so I’m clipping the fringe back! I’m wearing a 1950s cotton skirt bought from Ampthill Antique Emporium, bought a few years back now. 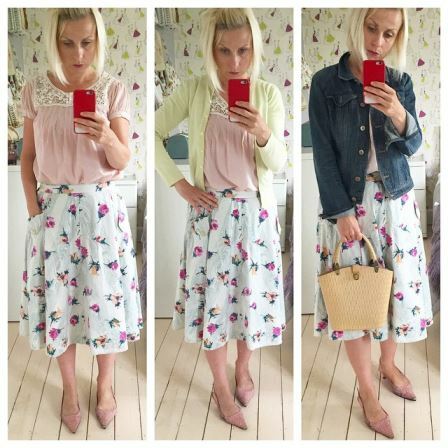 I’ve added a silk feel top from Primark, an old yellow cardigan from Tesco, my trusty denim from Next and my favourite pink shoes from LK Bennett. They are a tad old now but I LOVE THEM! 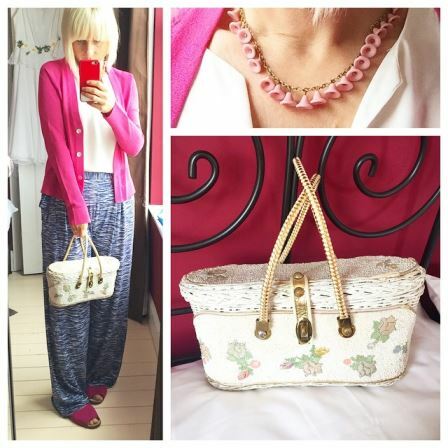 The bag is a 1950s bucket bag bought from a local charity shop. 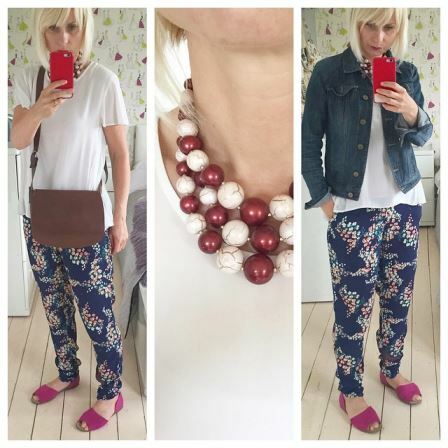 Here I am wearing mainly modern: Monsoon trousers, Primark pleated top, F+F pink shoes and again the denim jacket (is it ever going to get so hot that I can take my jacket off?) The beads are 1960s and the bag is 1970s: both from ebay. It was slightly warmer so my legs came out! 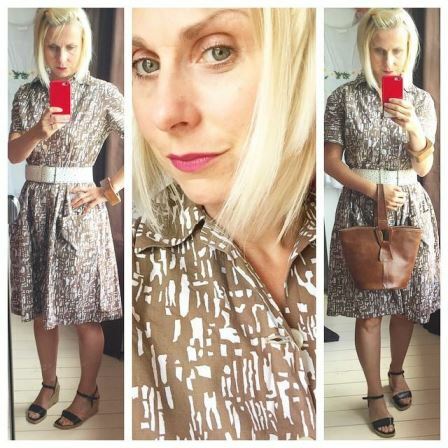 I’m wearing a 1950s cotton day dress bought from Scrooge – a vintage shop in Northampton. The belt was from Accessorize, platforms from LK Bennett (both years old) and the bag is an original leather 1950s vintage Norris bag. Yep cold again so I wore my Next chinos, a Top Shop blouse and my red Faith shoes. 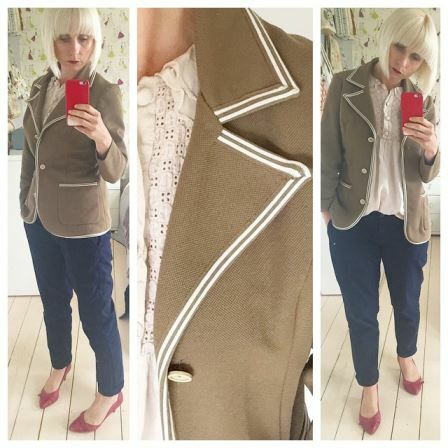 The blazer is a 1970s jacket bought from a jumble sale for 20p! And more importantly, I have had a hair cut and my roots done! Yay! We went out Saturday evening in Buckingham and it was very rainy! 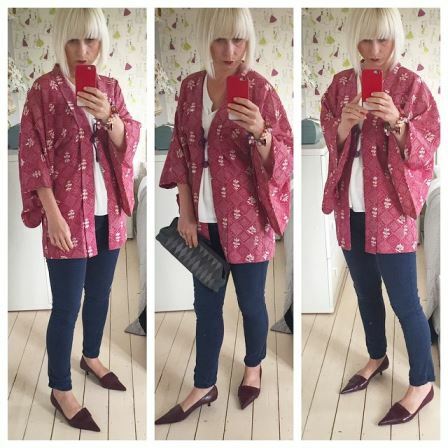 So I wore my jeans for the first time this month but dressed them up with this 1970s kimono bought from Beyond Retro and a grey snakeskin 1970s clutch bag bought from ebay. The shoes are serious winkle pickers bought an age ago from Top Shop. For Father’s Day I wore modern clothing teamed with vintage accessories. The trousers and shoes are both from F+F at Tesco and the cardigan came from French Connection in the 1990s! You can’t say I don’t keep hold of my fave clothes can you? The necklace is so cute – vintage and from ebay. The bag is by Midas Of Miami and is one of my favourites; Adam bought it for me from Ampthill Antiques Emporium a few years ago. I am so loving the dressing up and embracing clothes that I havent worn in a while…or even years. I reckon I will keep this up into July! I can’t choose between your outfits but you’ve got some fab ones and handbags. I’m going to put my pink cardi with my blue wide leg trousers tomorrow. I’ve not done that combo yet.